Being a gearhead is a way of life. When you’ve got gasoline in your veins, an engine in your heart, and the latest new models on your mind – you can’t just turn it off. Unfortunately, the latest automotive news doesn’t always get the front-page treatment from a lot of news sources. Thankfully, we have the internet and you can make it your mission to stay up to date with industry news, best practices for automotive upkeep, buying guides and more. But where to start? Take a look at this list of our 100 Favorite Automotive Blogs. Everything from vintage and classic cars to the latest in industry news can be found on the Car Gurus blog. This crew keeps the coverage up to date, accurate, and informative which is why Car Gurus is a daily stop for so many automotive nuts on the net. 3 Articles We Like: Costco Auto Buying Program: Scam or Good Deal? What Happens When a Buyer Never Registers a Car You Sold? Unbiased auto reviews and industry news can be found on The Truth About Cars, as well as editorials and opinion pieces. Plus, you can find tips and best practices on every subject from finding aftermarket parts to selling and old vehicle on eBay. Plus, the ongoing listings of junk yard finds are worth the visit alone. 3 Articles We Like: Should You Sell Your Car At Carmax? The writers behind Automoblog really have a passion for what they do, and it shows up in the quality of their work. The latest news, videos, and editorials are posted here weekly, making it no surprise they’ve found such a devoted fanbase. This site also keeps eyes peeled towards the future, giving you sneak peeks of what the future of driving may hold. 3 Articles We Like: Coupe VS. Sedan: What’s The Difference? How good are used cars? Being “car chic” is easy when you have Be Car Chic at your disposal. This multi-faceted blog was founded by Melanie Batenchuk almost a decade ago, and since then it has served to educate and empower women to take initiative in vehicle maintenance and mechanical know-how. For women who like to drive, this blog is a must. 3 Articles We Like: Who will sell the first affordable hybrid convertible? The Leith family has been in the business of buying and selling cars for more than half a century. The know-how and expertise you’ll find on LeithCars.com is a testament to that fact. This blog is divided into several categories for easy navigation. You’ll also find new car reviews, news, and videos. 3 Articles We Like: Why Was the Nissan Skyline Illegal in the United States? Billed as the bare-knuckled, unvarnished, high-octane truth, The AutoExtremist is a blog for those who are extreme in their love of automobiles. The blog’s founder, Peter DeLorenzo has been fascinated with cars since birth, and after spending decades in the auto marketing industry, he decided to share some of his thoughts with the world. 3 Articles We Like: The Glory Days, Part I.
Ford gets the PowerShift dual clutch transmission right, but is it too late? Remembering GMC Crackerbox Trucks – Stubby, Square, and Tough! See How You Can Make Your Own DIY Sheet Metal Brake At Home. This One Is Super Cool. They call Detroit the Motor City, and they call The Detroit Bureau the voice od the automotive world. You’ll see why after spending a few minutes here. They’ve got all the latest news and an easy-to-use archive feature that allows you to dig back into the annals of car history. 3 Articles We Like: With Q2 Earnings » Is Your Car Up for a Buyback? Some people have big love for small cars. For these people, Subcompact Culture is the blog of their dreams. This site keeps readers up to date on all the latest trends regarding micro cars, compacts, and of course, subcompacts. Though the cars are small, the amount of regularly updated content on this blog is huge! 3 Articles We Like: The Venerable Toyota 1NZ-FE: Old. Reliable. Tunable? Tips New, Certified Pre-Owned or Used Car? One of the most recognizable names in the industry, Edmunds offers some of the most thorough model-by-model comparisons available online. Buying guides as well as advice on leasing can be found here as well as what to expect when it comes to pricing and much more. You can buy a car without checking Edmunds, but it isn’t advisable. 3 Articles We Like: Which Vehicle History Report is Right for You? Do You Need an All-Wheel-Drive or Four-Wheel-Drive? Tred Test Drive Blog dedicates most of its content to buying, selling, or trading vehicles. Before you sell or trade your car (or buy a new one) you need to know what the market says its worth – Tred Test Drive Blog can help you in this research. You’ll find some of the best tips and tricks here. 3 Articles We Like: How Many Miles are Too Many? Voted “Dealer of the Year” in 2018 and 2017 by Dealer Rater, Auto City in El Cajon, CA is really something special. But even if you don’t live in the area, Auto City’s blog provides useful information about cars and car shopping to people all over the country. 3 Articles We Like: How Many Miles Are Too Many when Shopping for Used Cars? Honda Accord VS Toyota Camry: Is There A Clear Winner? 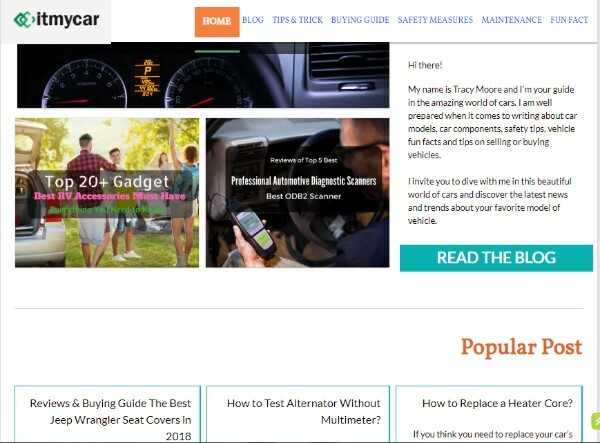 The blog on All About Automotive is a great place to get great info about how to keep up on your car. Here you’ll learn about everything from anti-lock brakes to heating and air conditioning systems. You’ll also learn where to look for affordable and trustworthy auto care when the time comes.3 Articles We Like: How Often Should I Have My Spark Plugs Replaced? What is the SRS Light that is Illuminated on my Dash? Should I Purchase A Used Cra With a Salvaged or Branded Title? So you’ve got a check engine light on, of course you can get a code readout, but what do you do with the code? On Openbay Overdrive, you can read a detailed list of the most common trouble codes and find out what they mean. With this knowledge in hand you can make smart moves when you take the next steps in getting your vehicle repaired. 3 Articles We Like: How Much Should It Cost to Replace a Tire? One of the great things about The Humble Mechanic is how down-to-earth and relaxed he can talk while he shares his expertise on Volkswagens and more. This site has articles, videos, podcasts, and much, much more. You can also send in questions to The Humble Mechanic himself and hope to see the response covered on the podcast! 3 Articles We Like: Why Does A Volkswagen Key Cost So Much? When you understand more about your car and its maintenance, you can build a better relationship with your mechanic, or any mechanic you speak to. That’s the goal of The BA Auto Car Blog. This blog also offers useful information about vehicle inspections, how to care for your eco-friendly car, and other interesting automotive tips. 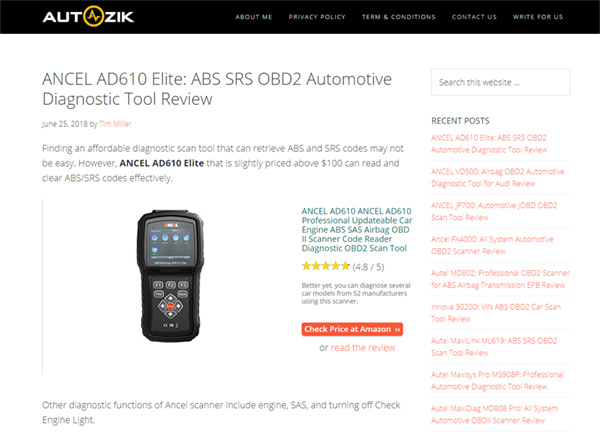 3 Articles We Like: We Put You in "The Driver's Seat" When it Comes to Auto Service Knowledge! On Cannon Auto Service’s Car Care Tips Blog, you can find useful car care tips relating to tires, transmissions, AC, brakes, and much, much more. This blog also features seasonal tips so you can be sure you’re staying up to date year-round from problems that might befall you on a cold winter’s night or hot summer day. 3 Articles We Like: Brake Repair and Safety go Hand-in-Hand! How Does Wheel Alignment Work? Replacing Two New Tires: Do they Go in Front or Back? Are hybrids durable? The 300,000 mile hybrid! Everything from keeping your car in good shape, to what to do on long road trips can be found at Automotive Training Center. You might have thought you didn’t need anymore training, until you saw the wealth of information on this blog! They also educational ebooks for download. 3 Articles We Like: What Is Paintless Dent Removal? Learn about everything auto fluid related at the blog on Peak Auto. Motor oil, coolant, anti-freeze, all the FAQs and DIY guides can be found here. If you need to top of your liquid levels and keep your car at peak performance, Peak Auto is the place to learn how. 3 Articles We Like: How Can I Best Maintain My Windshield Wipers? The blog on Elite Auto Repair is the perfect place to beef up your knowledge and know-how on cars and car repair. You’ll find everything from general maintenance procedures to how to get your car through the winter on this informative blog. And if you’re in the area you can even go in for a tune up. 3 Articles We Like: My Car Is Overheating! What Could Be Wrong? What Do I Do? What's the Most Important Maintenance After Buying a Used Car? So your check engine light turned on, now what? You can get your OBDII code read at many auto parts stores, but you probably still have questions in your mind about what the code means. That’s where OBD Advisor comes in. This blog will tell you everything you need to know about OBDII codes and the best readers for them.3 Articles We Like: What Transmission Do I Have? Is the 57′ Chevrolet Bel Air better than the 55′ and 56′? Should the Cisitalia-Porsche 360 Have Changed GP Racing? When it comes to cleaning your car, there’s a lot of double talk out there on the internet. But if you want the skinny with no minced words, head on over to Automotive Spaces. This blog will tell you all the best information about how to clean your car and with what products. 3 Articles We Like: Steering Wheel Lock Up While Driving – Causes & How to Fix? You can never be too safe on the road, and for many of us it’s been many years since we took Driver’s Ed. So why not brush up on safety tips in a fun and entertaining way with The Safe Driver. Here you’ll get advice and life hacks on paralleling parking, mirror adjustment, and many other subjects that will perfect your skill behind the wheel. 3 Articles We Like: How close to the corner do you park? Defensive driving or offensive driving? How often should you check your mirror? Ever Seen A Range Rover County Classic Powered By A BMW V12? The GREAT Debate: Is The All-New Honda Accord The FIRST Ugly Design From Honda In A While? The internet is chock full of blogs that range from funny to informative - and there is certainly no shortage of automotive blogs. We hope this list of the 100 Best Car Blogs has provided some useful tips on where to find the best of the best. Whether your goal is to buy a new car, repair a current car, or stay up to date on the industry, or just have a few laughs, the blogs we’ve listed here will help you get the job done.